Kids Math Teacher: Want to win a class set of Kindle Fire Tablets? Math Madness competition has that among its awesome prizes! Want to win a class set of Kindle Fire Tablets? Math Madness competition has that among its awesome prizes! March marks the time when basketballs are flying, baskets are being scored - and students are doing math! 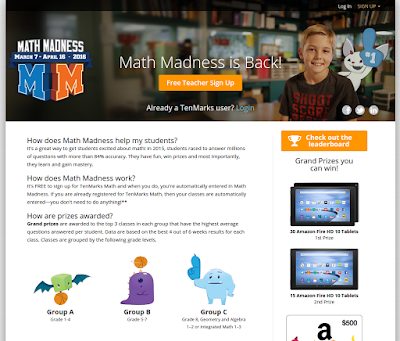 TenMarks, an Amazon company offers free online math programs for second through twelfth graders, has kicked off its 5th annual Math Madness competition for elementary, middle, and high school teachers and students last week. 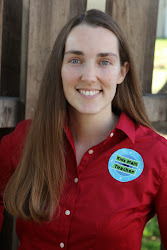 The goal of this competition is, of course, to get kids excited about math! Through some friendly competition, students all across the United States compete to answer millions of math questions with grand prizes awarded to the top three classes in each group. The contest ends April 16th. With so many students today not confident in math, participating in Math Madness helps students learn and gain mastery in math while having fun and winning prizes – in 2015, the Math Madness competition saw millions of questions answered with more than 84% accuracy! The way it works is pretty simple – teachers sign their class up for TenMarks Math for FREE, students solve math problems and on April 16th after a six- week period, prizes are awarded to the three classes in each group that have the highest average questions per student. Classes are grouped as follows: Group A (Grade 1-4), Group B (Grade 5-7) and Group C (Grade 8, Geometry and Algebra 1-2 or Integrated Math 1-3). This year’s grand prizes include a full classroom set of 30 Amazon Fire HD 10 Tablets, a set of 15 Amazon Fire 10 Tablets, a $500 Amazon.com gift card and weekly prizes for ice cream and pizza parties are awarded to the classes that show the most improvement. To get the word out, I'm doing a rafflecopter giveaway and donating a copy of my book The Pancake Menu: What will you order? ($25 value) to one lucky US winner. Please share the news and best of luck to your class with Math Madness! FYI, I downgraded to the free Rafflecopter, so it starts at midnight tonight and goes for one week! Best of luck! I think the Math Madness sounds so fun and engaging! I haven't heard of it before, but it's great!